With unmatched sensitivity and unparalleled flexibility,the FluoroMax Series can meet all of your lab’s experimental needs. 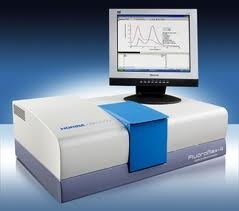 sensitivity of a modular fluorometer to a tabletop unit. FluoroMax-based solutions are available for measuring solid and liquid samples,with high throughput screening, cryogenic or elevated temperatures, absolute quantum yields, microliter volumes, stopped flow mixing or titration, and even micron scale measurements using a microscope. With the industry’s most extensive list of accessories, the FluoroMax series offers unparalleled flexibility to meet all of your lab’s experimental needs.